Dalí Quartet performs benefit concert with clarinetist Ricardo Morales. 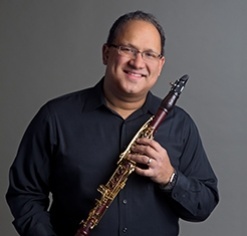 Dalí Quartet and Puerto Rican clarinetist Ricardo Morales from The Philadelphia Orchestra were scheduled to play a concert on Sunday October 1st at the Sala Sinfonica Pablo Casals in Puerto Rico. Due to the devastation of the hurricanes Irma and Maria, the concert was postponed. Instead, the Dalí Quartet and Ricardo Morales hosted the concert in North Wales PA, and raise funds to help Puerto Rico. Nearly $3,000 was raised and donated to help relief efforts. All proceeds were contributed to United for Puerto Rico and the peer-to-peer artist relief drive through Pregones Theater. See the Facebook Live video of the concert.